Lucerne (Luzern in German, Lozärn in Swiss-German, Lucerna in Italian)  is a beautiful small city in the heartland of Switzerland, across the lake from Altdorf, where legend has it William Tell shot an apple off his son's head. In addition to being a fine place to visit in and of itself Lucerne is a great base from which to explore famous Swiss sites such as Mount Rigi and the Rütli Meadow. Kapellbrücke - the ensemble of the bridge and the old tower is one of the major landmarks of the town. The first city to join the Swiss Confederation, today Lucerne is a lovely small city with a thriving tourism industry, owing mainly to its status as a gateway to Central Switzerland. The city became a center of Swiss history and legend. Tourism in Lucerne has a distinguished history dating from the mid 19th century, with Mark Twain among them. In "A Tramp Abroad" he recalls the nascent souvenir business, and other budding examples of the tourism trade. Thanks to its central location Lucerne can be reached easily from nearly every other city in Switzerland using the Swiss Federal Railway . There are hourly trains from Olten and Zurich Airport and half-hourly trains from Zurich, and a direct train every hour from Berne. The "Zentralbahn" branch of the Swiss Federal Railway provides also hourly trains between Interlaken and Luzern during daytime. Lucerne sits at the north end of the Vierwaldstättersee, one of the busiest waterways in Switzerland, for travel information from Schwyz, Flüelen, Weggis, and outbound points see the schedule at the Schifffahrt Vierwaldstättersee . Able-bodied travellers will find Lucerne a complete joy to get around in on foot. The Old-Town is tiny, and most other interesting sites are within 20 minutes or so walk, there is also a city bus system , as well as assistance for disabled visitors on request from Mobility International Switzerland . The Lido beach and the Swiss Transport Museum are a bit further out and can be reached by bus or by one of several boats per hour from just in front of the central railway station. Lucerne also makes a very good base for discovering the rest of Central Switzerland, using the Swiss Federal Railway , the Schifffahrt Vierwaldstättersee , or any one of several private rail or boat companies. Bicycles are available for rent at the central railway station, at ticket window 21 on the lower level. For 31 CHF per day, you can rent a 24-speed, sturdily-built bike with a baggage clamp. Electric bikes are also available. Bike pick-up and drop-off are around the left side of the train station, at a kiosk across the street from the Swiss Post building. Bike lanes are present on most secondary streets, and Lucerne drivers are generally aware of and polite towards bicyclists. Lucerne has an efficient bus network: Verkehrsbetriebe Luzern  (German only). It covers the city and the suburbs. Chapel Bridge over the Reuss River. 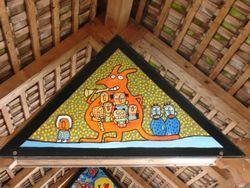 During Fasnacht the paintings on the bridge are covered by paintings promoting the various bands. The Chapel Bridge, The Chapel Bridge, a landmark of Lucerne, is said to be the oldest woodbridge of Europe. The Bridge is made with wood and was built in 14th century as a protection for the city. It's amusing walking over it as you can see about 100 pictures of 12th century city life and Swiss history. Join one of the walking tours going around! Unfortunately the bridge burned down on 18th August 1993. Within a few months it was rebuilt. The tower used as oubliette is still in original condition. The Swiss Transport Museum , Lido beach (the first stop for boats leaving from the central train station, preferably reached by bus). With its large collection of trains, planes, automobiles, and motorcycles this museum of means of transport is a great place to spend an afternoon. If you get tired of the real train engines you can check out the model railroad or the miniature working steam train. The air section also features several space travel exhibits, including an un-used project Mercury capsule. Basic admission is 32 Chf. for adults, 21 Chf for children 6-16, and free for younger kids. You can get a Lucerne Museum Pass - 36CHF for 7 musuems that includes this one rather than pay 30 for just this one museum. The old city wall (Musegg Wall). There are several towers which you can ascend, including the clock tower - the clockwork mechanism is huge and exposed on the inside. The clock has 'First Strike rights' by law, and so chimes at 1 min before the hour. Unfortunately what little explanatory signage there is on the wall is almost all only in German. Lucerne Art Museum  Is underwhelming compared to the Rosengart. If you happen to have a Lucerne Pass and the weather is bad you still might choose an alternative. The Rosengart Collection (Sammlung Rosengart) , Pilatusstrasse 10, tel: +41 41 220 16 60 ([email protected]). April-October: every day, 10 AM-6 PM; November-March: every day, 11 AM-5 PM. Well over 200 works by 23 artists of early modernism, including 125 works of Paul Klee and about 50 by Pablo Picasso. Also works by Cézanne, Chagall, Miró, Pissarro, among others. The collection also houses 200 photographs -- previously housed in the Am-Rhyn-Haus -- by David Duncan Douglas, LIFE’s WWII photo correspondent who arrived with his camera uninvited at Picasso’s villa “California”, was welcomed by Picasso and his family, and over the years produced an intimate portrait of the artist’s day-to-day life. Picasso's living room was his studio, and domestic scenes -- a ballet lesson, Picasso drawing with his children, or wrapping himself in the cape and hat of his native Spain -- play out within the backdrop of some of his most famous works. Admission CHF 15 (CHF 8 for students, children 7-16 years). Fasnacht Some cities of Switzerland including Lucerne and Basel celebrate a rousing carnival just before lent each year. 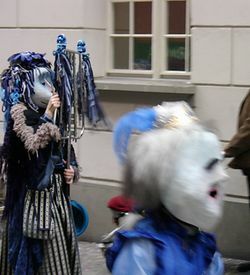 The version celebrated here is famous for its chaotic "march any direction you like" street parades of the so called Guugemusig (band of wind instruments and drummer, typical to the carneval of Central Switzerland) and elaborate masks. The carneval week of Lucerne starts on the Fat Tuesday and ends at Ash Wednesday. The programm in short: Fat Tuesday, Urknall (big bang) at 5am is the official beginning, music on the streets all the day in the city, mask parade from 2pm along the lake, music on the steets in the evening; Friday to Sunday music and masksparades in all the towns and villages of the region; Güdis Monday, second Urknall at 6am, rest dito Fat Tuesday; Thursday big street concert in the whole old town and surroundings, end of the official carneval at midnight... but it continue in the bars until morning of Ash Wednesday. As with carnival elsewhere the exact date on the calendar is variable according to the phase of the moon. You find the date of the next Fat Tuesday (SchuDo, Schmutziger Donnerstag) here: . If you don't want to be recognised as a tourist, put on some colorful clothes. Most of the people are dressed in colors or in masks. In the last years, the cities of Zurich and Berne started to copy Central Switzerlands carneval. At the moment mood and music isn't half as good as in Lucerne. Explore the Old Town One of the main reasons that Lucerne attracts so many travelers is its small but remarkably preserved old town. You can get lost (for a few minutes anyhow) in its maze of streets, passages, and squares, admiring the many and varied murals painted on what seems like every other building. A nice short walk on the Museggmauer starts at the Schirmer-Turm, walk up the road near Jazzkantine, open only at daytime. Ascend Mount Pilatus  - a famous mountain overlooking the city of Lucerne. Its peak can be reached by the world's steepest cogwheel railway from Alpnachstad (not operating in wintertime) and all-year-round by cable-car in three sections from Kriens (10 minutes by trolley bus no. 1 from Lucerne as far as 'Linde'). This trip is definitely a must and gives you a good impression of a wild and rocky peak with a marvelous view to the "real" Alps. Of course you can walk to the top on foot, which takes at least 4 hours from Kriens. A pleasant alternative is to walk down to Kriens from the bottom of the middle cable-car section. In addition to hiking, there are several other activities, including a suspension rope park and a 1,350 m long toboggan (both at the second stop of the cable-car from Kriens). Even if you don't plan to hike, allow for at least three hours to spend on Pilatus. Paraglide from Pilatus and Rigi  Paragliding down from the majestic mountains surrounding Lake Lucerne is a unique experience. Tandem paragliding is possible all year round with pilots certified by the Federal Office of Civil Aviation (FOCA) of Switzerland. The shopping in Luzern has improved somewhat since Mark Twain's visit. You'll find several good department stores with acceptable prices for most items, as well as pricy specialty shops. The Old Town is pedestrianised, and the lively new part of town also boasts a good selection of shops. Be aware that shops (including supermarkets) generally close at 16:00 on Saturday and are closed on Sunday. However, shops at and below the main train station (RailCity) are subject to different laws and are open until the evening every day. Attractive markets are held several times a week selling fresh and artisan produce, plants and handicrafts. Luzern's station hosts several stores which have longer opening hours then most other shops. Treibhaus Luzern , they have fine food. 2 menus each day (menu Chf 13, students Chf 7), snacks, donuts and very fine coffee. There are concerts at night. Migros or Coop. Migros and Coop are huge supermarket chains with a lot of budget products. There is a small Migros and a bigger Coop at the train station, near the tourist office, perfect to buy something to eat if you arrive or leave Lucerne. There are other Migros around, ask the people. Farther there are Migros and Coop Restaurants self-service restaurants. Restaurant Bodu, exquisite French Cuisine. Jazzkantine , quite small but comfortable bar. They have a stage in the basement. Sometimes there are jazzists playing (4 to 8 times a month). In the same building is the local jazz school, so it's a kind of student bar. Shamrock Irish Pub (formerly Gracie Kelly's) in the old-town, 5 minutes walk from the train station with great selection of Irish and Swiss drinks, home-made food, sports on display, karaoke nights, live music, pub-quiz. Treibhaus Luzern , Small but cool alternative Club. They have cheap food (2 menus each day) too. Sedel , the place where punk rock goes on. In the 80s it was the place the youth rebellion went on. Unfortunately it lost a bit of its idealism, nevertheless it's still the club of mothers don't want to let go their kids. Today there are a lot of concerts from Ska to Britpop to Postrock to Gothic. The building is an old women jail and was converted to music practice rooms for bands in the 80s. There are about 60 bands rocking and practicing their sets. So, if you'll here some noise somewhere in it, just knock at the door an come for a jam session. Rathaus , Simply the best beer you will ever have in your life. Brewed only at this small restaurant/brewery. Get the specialty beer. You will not be disappointed. Bar 58, Nice neighborhood bar on Klosterstrasse. Bar 59, Newly opened by the former owners of Bar 58, larger and has live music venues as well but still has a neighborhood bar feel - on Industriestrasse, hidden in the basement of a warehouse looking building. Lucerne has many clubs. The internet site tillate  is a good place to look up what's up. The three bakery chains Hug, Heini and Bachmann have several good cafés spread all over the city. Mill'Feuille, Mühlenplatz 6, . Lots of restaurants in Lucerne have a great view, but what impresses me about Mill'Feuille is the quietness (away from the busiest tourist spots) and the beautiful interior. The food is pretty good, and the value-for-money is OK by Swiss restaurant standards. For its size, there are quite a few places to stay in Lucerne, in all price ranges. Lion Lodge Luzern , Zurichstrasse 57, +41 (0) 41 410 01 44, [email protected]. Next to Lion Monument, Old Town and shopping center. Free kitchen facilities and bed sheets. 3 large verandas. Dorm/shared rooms CHF 32+. Backpackers Lucerne  , Alpenquai 42, +41 (0) 41 360 04 20, fax: +41 (0) 41 360 04 42, [email protected]. Dormitory: Chf. 32 pers/night; Double Room: Chf. 36 pers/night (Sheets included), no curfew, no lockout, no membership, Phone them as they don't accept e-mail booking. As of September 2012, the hostel has online booking and accepts reservations by e-mail. Free kitchen facilities. It's a very nice place, clean, close to the lake and closer to the old town than the youth hostel Lucerne. A lot of clubs (Treibhaus, Schüür) are just around. Youthhostel Lucerne . Am Rotsee, Sedelstrasse 12. [email protected]. Dorm rooms only, CHF 30+. Cascada, Bundesplatz 18, CH-6003, ([email protected], fax: +41 (0)41 226 80 00). Member of Swiss Quality Hotels International. Located 500m from the train station. Single room from 197CHF, double room from 324CHF (Rates of march 2009). Monopol, Pilatusstrasse 1, CH-6003, ([email protected], fax: +41 (0)41 226 43 44). Member of Swiss Quality Hotels International. Located right opposite the railway station. The famous Chapel Bridge is reachable within only 2 minutes by foot. Single room from 230CHF, double room from 270CHF (Rates of low season 2009). Waldstätterhof, Zentralstrasse 4, CH-6003, ([email protected], fax: +41 (0)41 227 12 72). Member of Swiss Quality Hotels International. Located 100m from the railway station directly in the city center. Single room from 129CHF, double room from 184CHF (Rates of low season 2009). Art-Deco Hotel Montana , Adligenswilerstrasse 22, ++41 41 4190000, fax: ++41 41 4190001. The Hotel Montana is a bit down the price and posh scale from "The Hotel". Some might prefer it though for it's architecture (surprise! art-deco), and the commanding views of the lake, and mountains. Double rooms with a lake view start at 250Chf. Lucernce is a heavily touristed destination, and where there are tourists there are pickpockets, con artists, and other sorts of folks up to no good. As with everyplace else keep your passport and other valuables where people can't get to them. 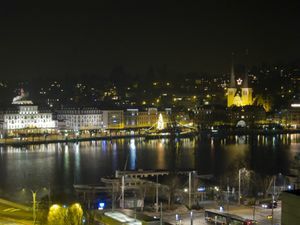 However, Lucerne is a friendly and safe city. Women can move almost anywhere at night free and carefree. It's a safe place, when you compare with other Cities in europe. This page was last edited on 17 May 2018, at 08:51.